Every year, Cancer Council NSW puts on one of Sydney’s greatest charity events: the 7 Bridges Walk. It’s a 27km walk to help raise funds to fight cancer. This year, in addition to taking on the Seven Bridges Walk, we were given the honour of rebranding and redesigning its identity. 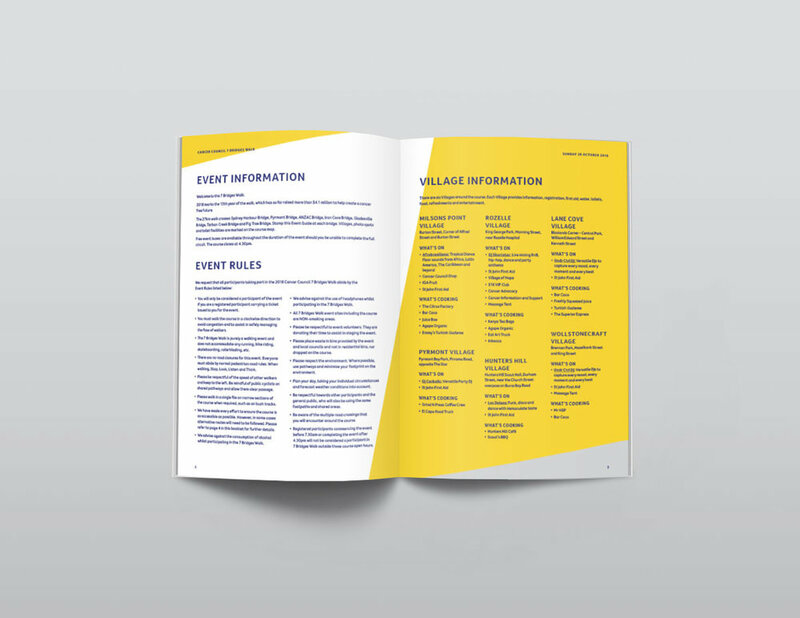 Whilst the event’s branding needed to be iconic in it’s own right, one of the challenges was to clearly link it to Cancer Council. With that in mind, we created a through the line campaign which features the number seven made up of seven shapes. These shapes can be broken apart to form the seven bridges of the walk. We maintained the well-established colours of Cancer Council to ensure brand recognition. The campaign spans across digital, website, event signage and collateral as well as email communication.